There is plenty of seasonal action on show at the reels, and if you are in the mood for cash payouts, then it's time that you headed down to the slots. Click here to play! 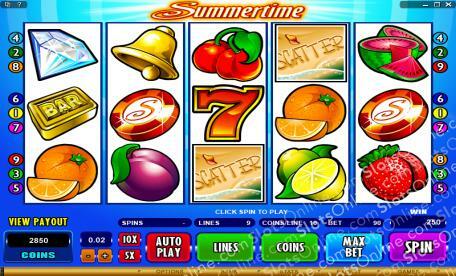 Summertime is a relaxing 5-reel slot played across 9 pay lines. The Gamble option is on offer every time you win, with chances to double, or even quadruple your winnings. The Summertime symbol is incredibly lucrative, with payouts up to 10,000:1, the ability to substitute for any other symbol except Scatters, and whenever it is used as a Wild in winning combinations, the payouts will be doubled. The Scattered Beach pays out whenever two or more appear on the reels, and if you manage to get at least three you will win yourself the right to play the Free Spins game. It is Summertime all year long on this slot, so get down to the sandy shores for your chance at a stack of cash. The Beach is Scattered and will trigger the Free Spins game when three or more appear on the reels. Payouts of up to 500 times your bet can also be won. The Summertime logo is Wild and can be substituted for any other symbol except Scattered Beaches. If you earn all five on active pay lines you wil win 10,000 times your bet.